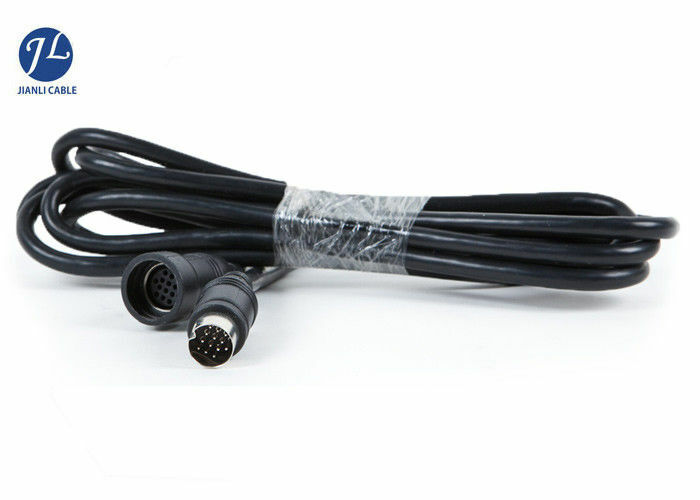 13 pin male to female dual camera car dvr cable, transmits video and power and other signal in one cable. Widely used in taxi/truck/trailer/bus/motorhome/long vehicle for connecting parking assistance, surveillance CCTV system. Weatherproof, shockproof for outdoor use. Compatible With: professional CCTV/ surveillance 13-pin connector monitor, rearview camera, DVD player, TV box. For video vehicle tracking system. This 13 pin cable is perfect for transmitting video,audio and power. Extend the cable on your camera easily with this extension cable. Don't waste time soldering or crimping together your own cables or voiding the warranty by splicing in your own wires. Most cameras only have a few feet of cable coming with the camera. This cable will help you to extend the power and video signals and even the audio(if the camera with audio). so it is much easier than to mount your camera at anywhere you would like within this range. 2.Q:How to buy your products? * Confirm Cable Length and Material. 3.Q:How can i get samples? A: It's my honor to offer you samples, but we can only give you three for free, and the freight should be paied by yourself. 4.Q:How many materials you can provide? A:There's some different materials from connector and cable, we usually use PVC/Nylon material to product connector, PVC/Rubber/PU/Silicone material was used in cable. Of course we can also according to your requirments to choose the material. A:Quality is priority. Aohua people always attach great importance to quality controlling from the very beginning to the very end. Our factory has gained ISO9001. Welcome to contact us for more details ,most competitive price for you!